Our new Koi from Ogata Koi Farm will be ready for sale starting this weekend! We’ve done our best to quarantine them and get them healthy for your pond, but we recommend that you further quarantine them for your own safety, especially if you buy Koi from multiple sources and your pond has Koi valuable to you. There is always a caveat when adding new Koi to your pond; that is the threat of exposing your Koi to new diseases. 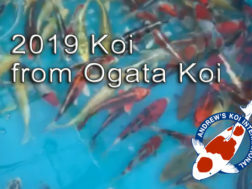 Ogata Koi Farm does extensive work in heating and treating their koi as well as testing every shipment they receive. We also put samples through heat and stress, medications, and draw blood samples for laboratory testing. However, certain diseases only appear at certain temperatures and no test can predict with 100% accuracy if a shipment is entirely free of disease. Not to sound scary, but take the necessary precautions for your pond, if you feel it is necessary!